In [KHII FM+], many mysteries are answered but many new mysteries are also born. In this version, thing relating to additional scenes are included, but during the story there are some questions that pop up, so we'll see if Nomura can't point us in the right direction. ---In [KHI], the King searches for a keyblade in the realm of darkness, but when he meets Ansem the Wise, is the realm of light keyblade he has the one that Sora is currently using? Nomura: No, the King has the ability to use keyblades from both the Realm of Darkness and of Light. This is an important point, there isn't just one keyblade from each world, just as many as there are people with qualified hearts. ---During the meetings, the members of Organization XIII are sitting in chairs. Is the height of these chairs determined by things like their skills and abilities? ---In the end of Sora and Riku's stories in [KH Re:CoM], Roxas looks back while Hayner and the rest are walking and eating ice cream, and without seeming to care, Hayner and the others continue walking. Is this because they can't see Roxas? Nomura: Well that, it's just because they don't know Roxas that they don't notice him, not because they can't see him. At that time, right after Xemnas explains Roxas' name, Axel says to leave things to him. Then, Roxas seems jealous of how Hayner and the others are enjoying themselves while eating ice cream, and Axel interprets this as him wanting some ice cream, so he is obliged to go buy him some. ---In the real Twilight Town, didn't Roxas cross paths with Hayner and the others and make acquaintances with them? Nomura: I suppose. You can think whatever you want about that. ---What triggered Roxas' seperation from the Organization? Nomura: Because he kept having recurring dreams of Sora, someone he didn't know, he felt he needed to leave the Organization to find out who these people he didn't know were. Because Axel didn't want him to go, he didn't tell Sora about Roxas in Castle Oblivion, did he? ---In Riku's ending in [KH Re:CoM], could you tell us the meaning of the scene where the King and Riku are walking together and Riku suddenly plops down. Nomura: That's because Riku realized he couldn't completely get rid of the darkness inside of him. The King mentioned it in [KHII], that because Riku held Xehanort's heartless in his heart he disappeared from the King's sight. It's a sort of foreshadowing. In this scene, the King's face looks worried for a moment because he felt that Riku might eventually no longer be there. Riku headed towards Diz in order to restore Sora's memories to normal, but in the end his departure from the King was so he wouldn't show his preparations to use the darkness. ---Could you tell us at what point Riku covered his eyes? Nomura: When he departed from the King. You don't know after the scene, but in Riku's ending in [KH Re:CoM], when he comes to wherever Diz is, he's already covered his eyes. ---Please confirm some things about Castle Oblivion. In KHII FM's additional event "The Truth about the Chamber of Sleep", you can gather from Xigbar and Zexion's conversation that Castle Oblivion existed in the Inbetween Realm before the birth of the Organization. The Organization then found it and used it for experiments about memories and to look for the Chamber of Awakening, right? Nomura: Yes. Since their conversation was about Marluxia's entry, they discovered the Castle before that. In fact its use, according to the Other Ansem Report 7, was for only 13 Organization members. Namine awoke in Castle Oblivion, but because she and Roxas were born at the same time, half of the Organization moved to the Castle. ---In KHII FM's additional event "To Put an End to Everything", Sora says "It should have been easy to say thanks to Namine, but I couldn't say it". At this point in time, does Sora remember the things that happened with Namine? Nomura: If he remembers, it's because Namine's existence was made possible by Sora, and when Namine and Roxas return to Kairi and Sora, many things were connected. Since Sora never got to say thanks to Namine, please think of that as a hint. ---In the additional event "Farwell to a Friend", there's a scene where Axel tells Roxas "You really do have a heart, don't you". What is the actual case here? Nomura: In this scene, it ends bringing up more mysteries about Roxas, so for the answer, maybe take care to follow your hunches well, it's also related to Xehanort's memories, but I can't give any specifics now. ---We'd like to inquire about the new secret movie "Birth By Sleep". In the new event "The Truth about the Chamber of Sleep", Xigbar mentions a "group that wields keyblades". Is he talking about the 3 armored people in the movie? Nomura: Yes, Xigbar witnessed them when he was a disciple to Ansem the Wise. ---The Lingering Sentiment is the same as the armored youth in the movie, but when he fights Sora he mentions "Aqua" and "Ven". Are those the names of the other 2? ---What is the armored youth's name? 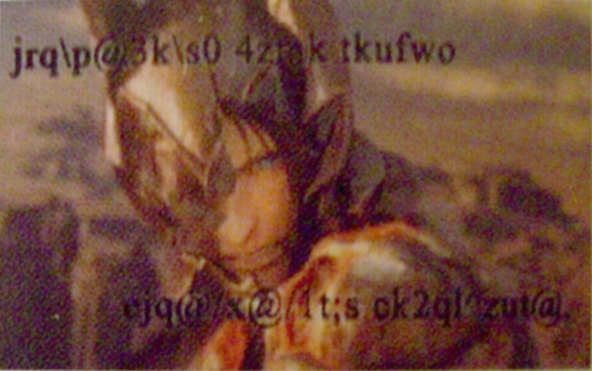 Nomura: His name appeared once in code in the 2006 Tokyo Game Show Promotional Video. Also, Ven is actually a nickname, his real name is a little bit longer. Sora, Riku, and Kairi's names can be seen as "Sky, Land, and Sea", the 3 armored people's names take the shape of different properties of the world "Water, Wind, and Earth". Nomura: I can't give any specifics about that. He may just resemble him, and if there is a connection, Sora may be related too. What I can say right now is that these mysteries are all connected to the story. ---In the beginning, the armored youth's eyes are blue, but at the end they change to gold. Is this revealing a change in him? Nomura: I can't give specifics about this either... I think everyone's imaginations are pretty capable so please try and anticipate a lot of things. This is the code that flowed across the screen for a moment during the Promotional Video. It can be decoded as "Master Xehanort's Avenger, his name is Terra. Not yet awakened, he is connected to those two."